Faculty from China’s Tianjin University of Technology spent two days at RIT touring the campus and learning more about building and equipping a clean room facility. 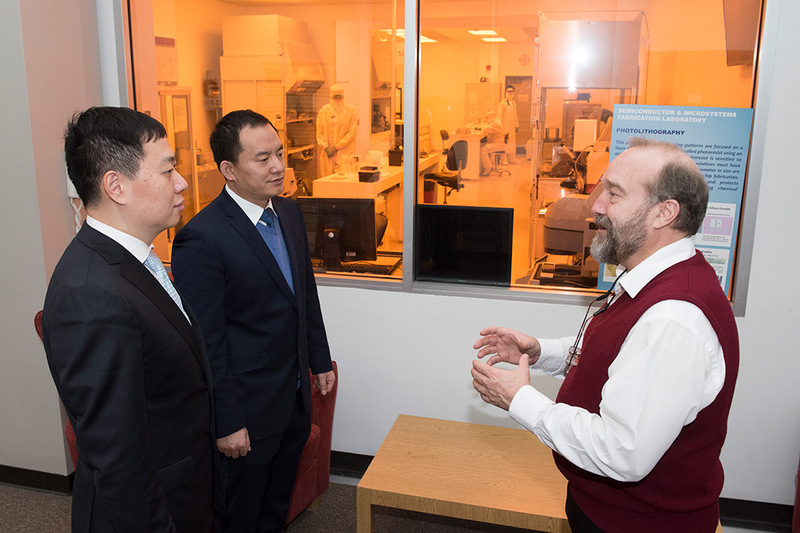 Tianjin University of Technology leaders toured the RIT campus and its Kate Gleason College of Engineering as the Chinese university looks to expand its teaching and research capabilities in the area of microelectronic engineering. The connection to Tianjin University of Technology is one of many international relationships RIT has established around the world to encourage faculty and student exchanges and to increase research collaborations and projects. A long time academic partner of both RIT and NTID, Tianjin University of Technology is one of China’s first technological universities providing education for the Deaf in the country. In 2016, RIT and Tianjin University of Technology entered into an agreement to expand the partnership to include more engineering educational opportunities. It has expanded its microelectronics programming, and the visit to RIT was a chance to collaborate with the group that established the first microelectronic program in the country in 1982 and to see its extensive Semiconductor and Microsystems Fabrication Laboratory. “We’ve enjoyed our meetings with professors and leaders of the engineering college. Our visit was a chance to discuss student exchange opportunities and to learn more about the college, especially the microelectronic engineering program,” said Enzeng Dong, professor and associate dean of Tianjin University of Technology’s School of Electrical and Electronic Engineering, who will lead the expansion of his university’s clean room facility to increase research initiatives for faculty and graduate students. The partnership entails a student exchange where undergraduates take three years of courses at their home university, then a fourth year at RIT or Tianjin University of Technology. As the semiconductor industry continues to expand globally, academics and research partnerships need to as well, said Robert Pearson, program director of the microelectronic engineering program. RIT has more than 60 countries featuring partnerships and study abroad opportunities at universities around the world to promote cultural and academic exchanges.